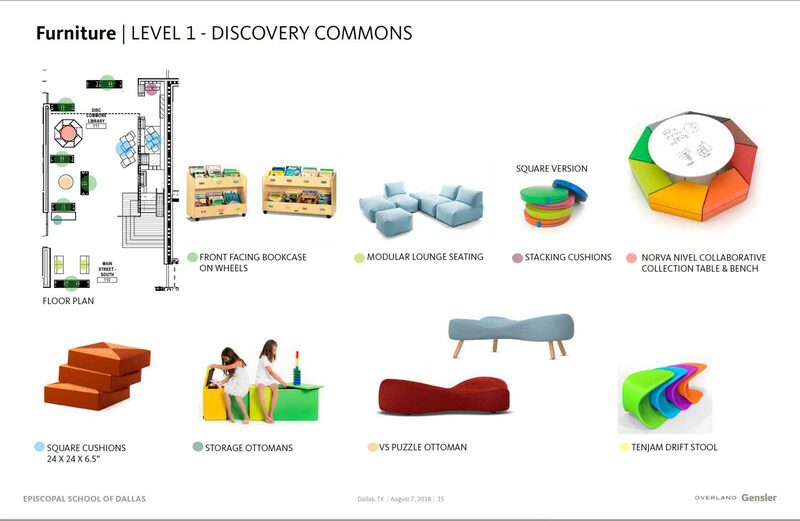 FF&E planning, after the vision was cast by faculty, begins with a diagram of each floor and experimenting with numerous options and configurations. 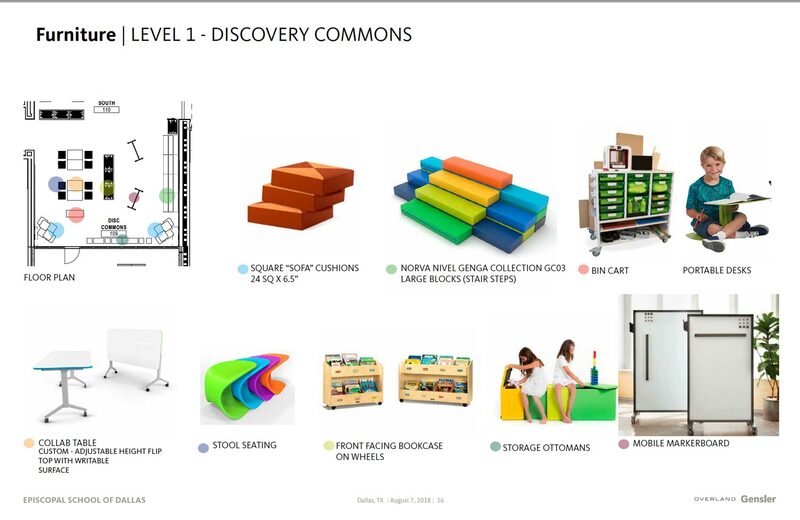 Time is spent on each specific space in determining what FF&E will facilitate the best teaching and learning environment. 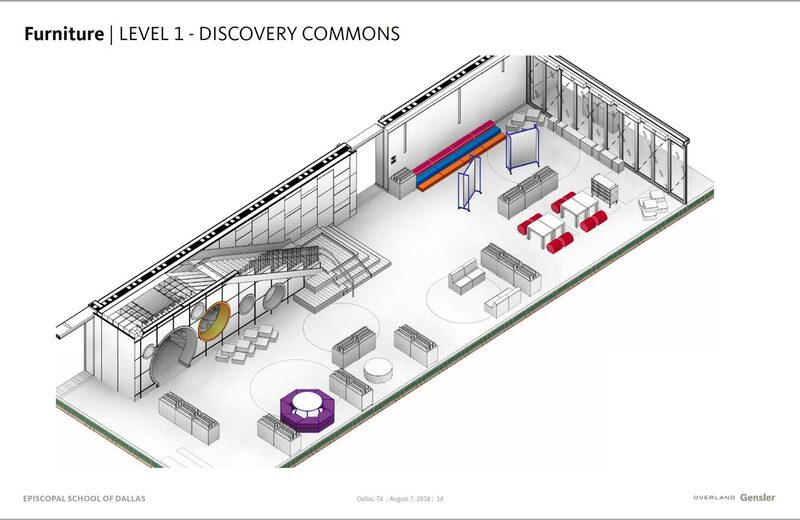 These three illustrations show how this process developed with the Discovery Commons space on the first floor. At this stage of the Lower School construction, signs of progress are easy to see whether you are standing on the track level of the Competition Gym, driving by on Midway, or walking out of a daily chapel service. The foundation has been poured and structural steel beams span nearly the entire building footprint; the skeleton of the building is almost complete. While this very visible activity continues, a great deal of behind the scenes work is taking place. What is termed "FF&E" is a significant portion of this work - Furniture, Fixtures, and Equipment. Not only do I see the acronym FF&E in almost every waking hour, I see it while I sleep! It is only a mild exaggeration to say this topic is dominating my every thought these days. New buildings are fabulous, no doubt about it. The "newness," sparkling interiors, and impressive exterior, provides a point of pride and energy boost for all who are associated with it. An empty new building would not have much of an impact. 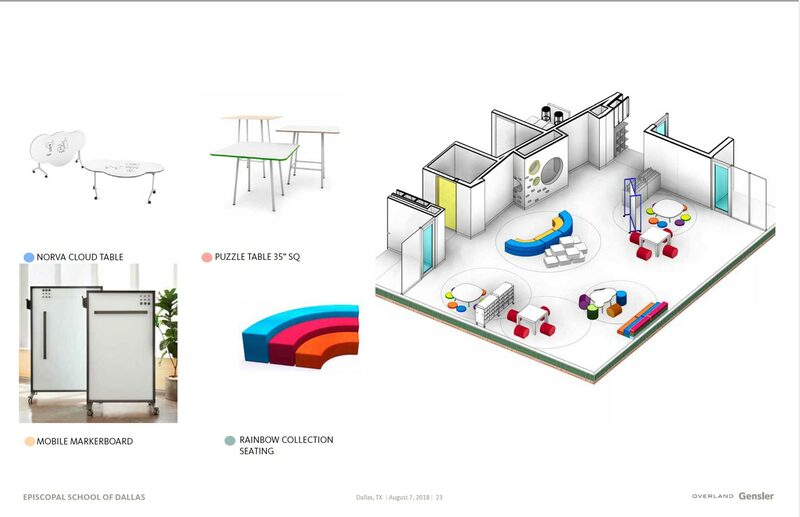 Undeniably, it's the people - students and teachers - who make a new school building come to life, but the important role furniture, fixtures, and equipment play cannot be underestimated. 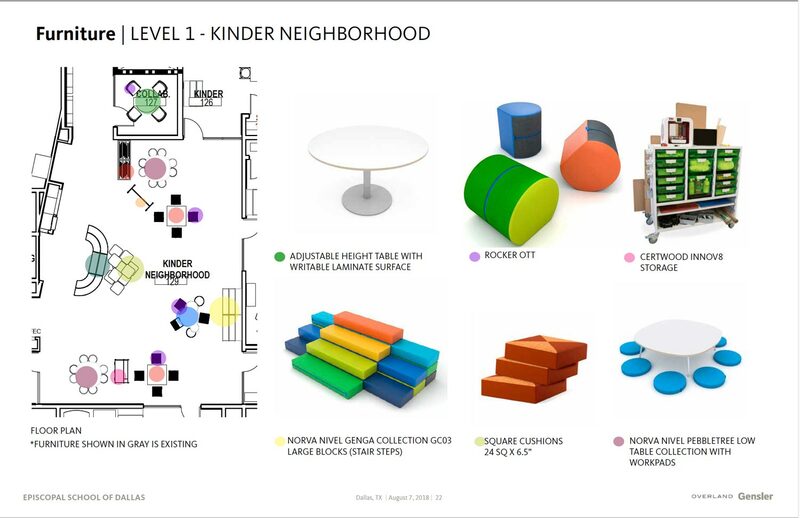 Teaching and learning shaped the design of our new Lower School, and the "right" FF&E will facilitate the learning process, not just compliment or support it. The conscious interplay of three key relationships - teacher to student, student to student, and students with their environment - allow FF&E to be a game changer in teaching and learning. This is especially true for young children whose bodies need to move and sometimes fidget. (Did you know movement in young children actually increases their ability to concentrate?) The FF&E our Lower School faculty envisions not only supports healthy movement, but it also adapts to a variety of teachable moments and is flexible and adaptable to a range of classroom dynamics. Gone are the days of "sage on the stage" classrooms, but rather interactive environments where the learners are the focal point. Ensuring creative and thoughtful decisions are made with the desired learning outcomes for our youngest students at the core is paramount. FF&E not only optimizes learning for our students, it also has the potential to be an intuitive and critical part of the learning process. The expressed goals and aspirations of our talented faculty kicked off this vision more than three years ago. 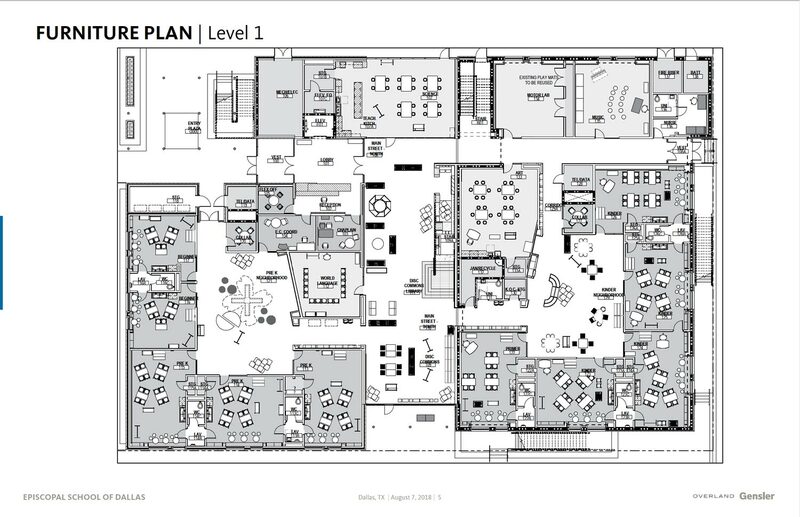 Over the next three months, all the various components of FF&E will be finalized as we prepare for a July move-in date. A painstakingly detailed and lengthy process, but when done right the upside is immeasurable. Another exciting, but not yet visible, part of the construction of our new Lower School.